Daniel E. Martínez received a PhD from the School of Sociology at the University of Arizona in May of 2013, and holds an MA in Sociology and MS in Mexican American Studies, also from the University of Arizona. 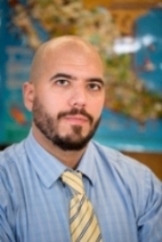 In addition to being a faculty member in the Department of Sociology, he is an affiliated faculty of the Africana Studies program and currently serves as the associate director of the Cisneros Hispanic Leadership Institute. Martínez’s research and teaching interests include criminology, juvenile delinquency, race and ethnicity, and unauthorized immigration. He is particularly interested in the increasing legal and social criminalization of unauthorized migration. He is one of three co-principal investigators of the Migrant Border Crossing Study, a Ford Foundation-funded research project that involves interviewing recently deported unauthorized migrants about their experiences crossing the US-Mexico border and residing in the United States. Martínez also does extensive research on undocumented border crosser deaths along the Arizona-Sonora border. Martínez, Daniel E. and Matthew Ward. Conditionally Accepted. “Agency and Resilience along the Arizona-Sonora Border: How Unauthorized Migrants Become Aware of and Resist Contemporary U.S. Nativist Mobilization.” Social Problems. Martínez, Daniel E., Jeremy Slack, Kraig Beyerlein, Prescott Vandervoet, Kristin Klingman, Paola Molina, Shiras Manning, Melissa Burham, Kylie Walzak, Kristen Valencia, and Lorenzo Gamboa. Accepted. “The Migrant Border Crossing Study: A Methodological Overview.” Population Studies. León, Kenneth Sebastian and Daniel E. Martínez. 2016. “To Study, to Party, or Both? Assessing Risk Factors for Non-prescribed Stimulant Use among Middle and High School Students.” Journal of Psychoactive Drugs. Available here. Sanford, Rachealle, Daniel E. Martínez, and Ronald Weitzer. 2016. “Framing Human Trafficking: A Content Analysis of Newspaper Reporting.” Journal of Human Trafficking 2(2): 139-155. Available here. Slack, Jeremy, Daniel E. Martínez, Alison Elizabeth Lee, and Scott Whiteford. 2016. “The Geography of Border Militarization: Violence, Death and Health in Mexico and the United States.” Journal of Latin American Geography 15(1):7-32. Available here. Martínez, Daniel E. 2016. “Coyote Use in an Era of Heightened Border Enforcement: New Evidence from the Arizona-Sonora Border.” Journal of Ethnic and Migration Studies 42(1):103-119. Available here. Martínez, Daniel E. 2015. “When I Wear my Alligator Boots: Narco-Culture in the U.S.-Mexico Borderlands, by Shaylih Muehlmann.” Contemporary Sociology 44(5):686-687. Available here. Ward, Matthew and Daniel E. Martínez. 2015. “Know Your Enemy: How Unauthorized Migrants Learn About and Perceive Anti-Immigrant Mobilization in the United States.” Migration Letters 12(2): 50-66. Available here. Slack, Jeremy, Daniel E. Martínez, Scott Whiteford, and Emily Peiffer. 2015 “In Harm’s Way Family Separation, Immigration Policy and Security on the U.S.-Mexico Border.” Journal on Migration and Human Security 3(2):109-128. Available here. Martínez, Daniel E., Reineke, Robin C., Raquel Rubio-Goldsmith and Bruce O. Parks. 2014. “Structural Violence and Migrant Deaths in Southern Arizona: Data from the Pima County Office of the Medical Examiner, 1990-2013.” Journal on Migration and Human Security. 2(4): 257-286. Available here. Martínez, Daniel E. and Jeremy Slack. 2013. “What part of ‘illegal’ don’t you understand? The consequences of criminalizing unauthorized Mexican migrants in the United States.” Social and Legal Studies 22(4): 535-551. Available here. Slack, Jeremy and Daniel Martínez. 2011. "Migración y el surgimiento de (in)seguridad en la frontera Estados Unidos-México." Sonarida 16(31): 25-28. Slack, Jeremy, Daniel Martínez and Prescott Vandervoet. 2011. “Methods of Violence: Researcher Safety and Adaptability in Times of Conflict.” Practicing Anthropology. 33(1): 33-37. Romero, Andrea, Daniel E. Martínez, Scott Carvajal. 2007. “Bicultural Stress and Adolescent Risk Behaviors in a Community Sample of Latinos and Non-Latino Whites.” Ethnicity & Health 12(5): 443-463. Slack, Jeremy, Scott Whiteford, Sonia Bass Zavala, Daniel E. Martínez, and Elizabeth Lee. 2016. “Collaborative Research on the U.S.-Mexico Border: Social Media, Activism and Impact of Scholarship.” In: Collaborative Exchanges in Global Places. Edited by June Nash and Hans Buechler. London: Palgrave/MacMillan. Martínez, Daniel E., Jeremy Slack, Alex E. Chavez, and Scott Whiteford. 2016. “Walking Toward and Deporting the ‘American Dream’.” In: The Latino, American, Dream. Edited by Sandra L. Hanson and John K. White. College Station, TX: Texas A & M University Press. Martínez, Daniel E. 2016. “Migrant Deaths in the Sonora Desert: Evidence of Unsuccessful Border Militarization Efforts from Southern Arizona.” In: Migrant Deaths in the Arizona Desert: No Vale Nada la Vida. Edited by Raquel Rubio-Goldsmith, Celestino Fernandez, Jessie Finch, and Araceli Masterson. Tucson, AZ: University of Arizona Press. Martínez, Daniel E., Jeremy Slack, and Prescott Vandervoet. 2013. "Methodological Challenges and Ethical Concerns of Researching Marginalized and Vulnerable Populations: Evidence from Firsthand Experiences of Working with Unauthorized Migrants." Pp. 101-120. In Uncharted Terrains: New Directions in Border Research and Methodology, Ethics, and Practice edited by Anna Ochoa O'Leary, Colin M. Deeds, and Scott Whiteford. Tucson, AZ: University of Arizona Press. Martínez, Daniel E. 2012. “Immigration, Latinos, and Crime: A Ward-Level Exploratory Assessment of Washington DC Property and Violent Crime Rates.” In: Hispanic Migration and Urban Development: Studies from Washington DC. Edited by Enrique Pumar. Cambridge, MA: Emerald Publishers. Martínez, Daniel E. 2016. “Im Schatten der Mauer: Die Auswirkungen des US-amerikanischen Ausbaus von Grenzschutz und verstärkter Zuwanderungskontrolle.” Friedrich-Ebert-Stiftung (Germany). Available here. Cantor, Guillermo, Mark Noferi, and Daniel E. Martínez. 2015. “The Criminal Alien Program.” American Immigration Council’s Immigration Policy Center, Washington DC. Report, November. Available here. Ewing, Walter A., Daniel E. Martínez, and Rubén G. Rumbaut. 2015. “The Criminalization of Immigration in the United States.” American Immigration Council’s Immigration Policy Center, Washington D.C. Available here. Reineke, Robin and Daniel E. Martínez. 2014. “Migrant Deaths in the Americas (United States and Mexico)”. Pp. 45-83. In Fatal Journeys: Tracking Lives Lost during Migration edited by Tara Brian and Frank Laczko. Geneva, Switzerland: International Organization for Migration. Report, September 29. Available here. Martínez, Daniel E., Guillermo Cantor, and Walter Ewing. 2014. “No Action Taken: Lack of CBP Accountability in Responding to Complaints of Abuse.” American Immigration Council’s Immigration Policy Center. Reports, May. Available here. Martínez, Daniel E., Jeremy Slack, and Josiah Heyman. 2013. “Migrant Mistreatment While in U.S. Custody.” Part I of Bordering on Criminal: The Routine Abuse of Migrants in the Removal System. American Immigration Council’s Immigration Policy Center. Reports, December. Available here. Martínez, Daniel E. and Jeremy Slack. 2013. “Possessions Taken and Not Returned.” Part II of Bordering on Criminal: The Routine Abuse of Migrants in the Removal System. American Immigration Council’s Immigration Policy Center. Report, December. Available here. Martínez, Daniel E., Reineke, Robin C., Raquel Rubio-Goldsmith, Bruce Anderson, Gregory Hess, and Bruce O. Park. 2013. “A Continued Humanitarian Crisis at the Border: Deceased and Missing Migrants Recorded by the Pima County Office of the Medical Examiner, 1990-2012.” Binational Migration Institute, Department of Mexican American Studies, University of Arizona. Available here. Slack, Jeremy, Daniel E. Martinez, Scott Whiteford, and Emily Peiffer. 2013. “In the Shadow of the Wall: Family Separation, Immigration Enforcement and Security.” Report. The Center for Latin American Studies, University of Arizona. Available here. Rubio-Goldsmith, Raquel, M. Melissa McCormick, Daniel Martínez, and Inez Magdalena Duarte. 2007. “A Humanitarian Crisis at the Border: New Estimates of Deaths among Unauthorized Immigrants.” Immigration Policy Center. Rubio-Goldsmith, Raquel, M. Melissa McCormick, Daniel Martínez, Inez Magdalena Duarte. 2006. “The ‘Funnel Effect’ and Recovered Bodies of Unauthorized Migrants.” Report submitted to the Pima County Board of Supervisors. Available here. Martínez, Daniel E. and Jeremy Slack. “What Makes a Good Coyote? Mexican Migrants’ Satisfaction with Human Smugglers.” Allegra Lab. April 6, 2016. Available here. Martínez, Daniel E. and Jeremy Slack. “Effectiveness of DHS’ ‘Consequences Delivery System’ Questioned.” American Immigration Council Immigration Impact. April 3, 2015. Available here. Evans, Michael and Daniel E. Martínez . “‘Gotaways” Increasing Faster than Apprehensions on Southwestern Border.” Migration Declassified: A Project of the National Security Archive. February 26, 2015. Available here. Martínez, Daniel E. “A Humane Border.” Who is Dayani Cristal? April 2014. Available here. Martínez, Daniel E. 2013. “Migrant Border Crossing Study: Motive, Impact, and Future Direction.” Anthropology News. July 2. Martínez, Daniel E. and Robin Reineke. 2013. “Undocumented Border Crosser Deaths in Southern Arizona.” Border Criminologies.June 22. Available here. Martínez, Daniel E. and Robin Reineke. 2013. “New Report Shows that Migrant Deaths Remain High in Arizona.” North American Congress on Latin America, Border Wars. June 5. Available here. Slack, Jeremy and Daniel Eduardo Martínez 2013. “Families or Workers? Criminals or Migrants?” North American Congress on Latin America, Border Wars. April 3. Available here. Rick Gladstone. “Research Doesn’t Back a Link Between Migrants and Crime in the U.S.” The New York Times. January 13, 2016. Avaiable here. “Herramientas de Perseverancia: Parte 1.” Telemundo Washington DC. April 29, 2015. Available here. Dennis Wholey. “Sociologist Round Table, Parts 1 & II.” PBS’s This is America & the World with Dennis Wholey. Aired August and September, 2014 (June 24, 2014 taping). Available here. Rachel Maddow. “Accountability lacking at border agency.” The Rachel Maddow Show. June 12, 2014. Available here. The Editorial Board. “Impunity and the Border Patrol.” The New York Times. May 11, 2014. Available here. Brian Bennett. “Border Patrol agents rarely disciplined in abuse cases, records show.” Los Angeles Times. May 9, 2014. Available here. Chappell, Bill. “Report Details Hundreds of Complaints Against U.S. Border Patrol Agents.” NPR. May 7, 2014. Available here. Damien Cave. “Complaints of Abuse by Border Agents Often Ignored, Records Show.” The New York Times. May 5, 2014. Available here. Laura Carlsen. “Arizona Border Crosser Death Rate at Record High.” Americas Program. August 8, 2013. Terry Greene Sterling. “Death in the Desert.” Newsweek. July 10, 2013. Available here. Emilie Easton. “Report: Number of border deaths remained steady, even as crossings fell.” AZ Capitol Time. June 6, 2013. Available here. Brian Showoff. “Report: Migrant deaths in Ariz. remain steady.” AZ Central. June 5, 2013. Available here. Cindy Caracmo. “In Arizona, border crossings down, but migrant deaths on rise.” Los Angeles Times. June 5, 2013. Available here. Recipient of the District of Columbia Sociological Society's 2016 Morris Rosenberg Award for Outstanding Sociological Achievement.